The Yamaha YBB-632 Neo Series Bb Tuba is a recently adapted instrument. Featuring a new leadpipe taper that produces better resistance. Not to mention that this tuba features the largest bell among Yamaha's BBb basses. At 500mm the bell increases this product's dynamic range. The repositioning of the fourth valve is one of the biggest improvements made to the YBB-632 tuba and one of the biggest changes for players. Where it was once uncomfortable and difficult to access, the fourth valve is now easily reachable and comfortable to hold for long periods of time. Instead of being tucked behind, the valve is now repositioned through the middle of the third valve slide making it closer for the player to reach. A natural connection is now made between the player and the fourth valve. The Yamaha BBb basses have been designed to meet the needs of all brass bands, with the influence of Simon Gresswell. The Yamaha YBB-632 comes with its very own 66D4 mouthpiece. This all-in-one package is perfect to get you started and allows you to play straight out of the box. Yamaha's standard mouthpieces produce a smooth attack, secure control, and easy playability. It gives players an ideal weight balance for all-around usage. Neo brass instruments are surrounded by knowledge, based on developments made through research at a molecular level. Neo use all of this information to help them make the best decision in regards to their choice of materials and processing methods. These instruments are made through a combination of the most advanced technologies and the expertise of Neo's master craftsmen whose largely redefined skills enable processing of materials to tolerances of up to 1/100mm. Neo work alongside some of the world's most professional artists. Working together to pull apart every piece of the Tuba in order to test each part individually. They then looked at how to redesign these pieces to meet the needs of today's players. This choice resulted in newly adapted instruments that are able to meet modern day requirements to a high standard. The YBB-632 introduces Yamaha's largest bell amongst its BBb basses, at 500mm this impressive bell has made some big changes. The size of it has really improved the instrument's dynamic range at the same time as producing a stable sound that envelopes the whole ensemble. The repositioned fourth valve improves the playability of the instrument whilst also making faster passages that are easier to play. Making the instrument easier to hold, the semi-circular shaped hand rest also reduces tiredness when carrying the instrument for a long time. The new leadpipe taper provides an enhanced resistance. By designing it around the angle of the mouthpiece led it now offers a more natural playing position. 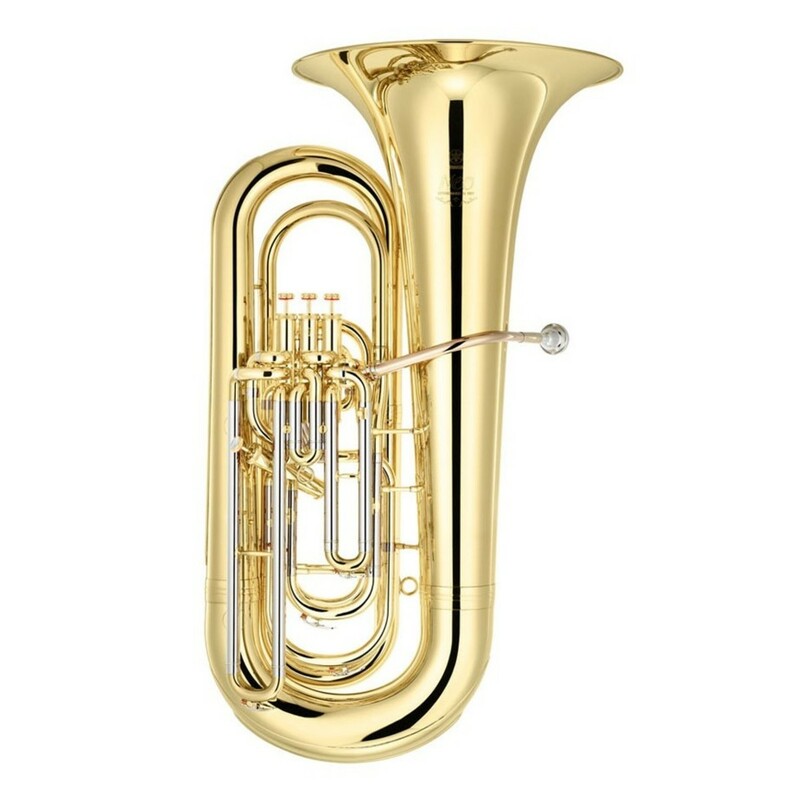 The Yamaha YBB-632 tuba features a yellow brass bell, which is generally more common on top of the range tubas. Due to the higher quantity of zinc within the brass composition, the yellow brass bell provides a brighter sound. The yellow brass lead pipe helps provide a direct sound with an edge to the tone. This combination results in the YBB-632 producing a bright full bodied sound with plenty of projection power and edge, suitable for orchestral/brass bands and wind bands.